Pete and the crew had a magical time building this treehouse getaway for sisters Rhonda and Roxanne, and Roxanne's husband, Jeff, near Omaha, Nebraska. Rhonda asked Pete to create a whimsical treetop cottage where she could retreat from the burdens of adulthood to unwind and spend time with loved ones. Roxanne also had a request: the treehouse had to include a martini bar! Pete tackled the sisters' requests with zeal to create a playful yet relaxing treehouse retreat. The turret encases the bathroom and stands eight feet tall with a four-and-a-half-foot diameter. Copper roofing was applied onsite to give the turret an old-world charm. Ian Franks, a master carpenter on our prefabrication crew, crafted the misshapen windows and added casings made of western red cedar limbs. Underneath the treehouse lies an extra bar with outdoor seating - Pete crafted this bar (with a custom juniper slab bar top) as a special space for Jeff. A sturdy stairway leads to the front door. The crew used reciprocating saws to cut whimsical curves in the overhang from rafters (look at the upper left corner for this detail). Asphalt shingles ensure a weatherproof roof. Inside holds a reading corner, game table, bar, bathroom, and staircase to the loft. The crew crafted this stunning custom slab bar top and liquor shelves. The rough-edged slab provides a rustic, natural look. Nelson Treehouse sources most of its slabs for custom built-ins from Wild Edge Woods, local mill in Oso, WA. A curved railing (check out the gorgeous natural stain in that wood!) leads to the "turlet" - the toilet inside the turret. This cozy corner is the perfect place to curl up with a good book. Up on the loft lies a comfy daybed and desk. The windows above the daybed open and provide sweeping views of the forest. Sticks - a fine art and furniture maker - crafted the beautiful custom game table. The screened-in porch offers excellent views of the surrounding forest. A bouncy suspension bridge leads to a satellite crow's nest. Imagine sipping a cool drink with friends on a summer evening in this sun-dappled crow's nest. 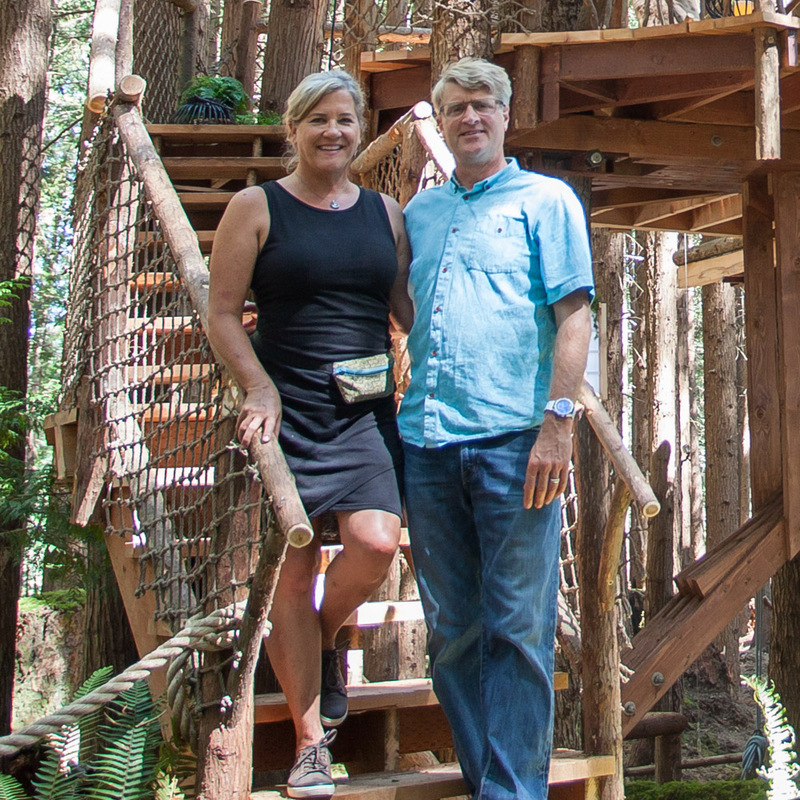 Rhonda, Roxanne, and Jeff's fairytale treehouse was one of our favorites to build! Its whimsy and charm speaks to the essence of childhood treehouses. Playful yet restful, a place for tranquil retreat as well as time spent with friends - this treehouse embodies these wonderful contradictions. Thank you Rhonda, Roxanne, and Jeff for a magical build! To stay up-to-date on all things treehouse, please subscribe to our mailing list and follow us on social media.